Large blue chicory flowers bloom along roadsides from June through October, opening in the morning but wilting in the mid-day sun. Each petal is actually a separate flower, making it easy for bees to gather lots of nectar and pollen in a single visit. Early risers and early morning commuters can enjoy the sight of large sky-blue, daisy-like blossoms along roadsides, especially after a rain. At this time of year, the rest of us are more likely to glimpse these bits of beauty as well, because the flowers stay open longer as our sunlight becomes weaker. The name of this weedy roadside plant is surprisingly familiar: chicory (Cichorium intybus). Also known as coffeeweed, the plant brings us the “chicory” flavoring in the famous coffees of New Orleans, as well as various salad greens with a slightly bitter tang. Chicory is now a weed throughout the U.S. and much of Canada, but it’s not native. It comes from the eastern Mediterranean area, where people have used it as food going back to Roman times and even to ancient Egypt. In parts of Europe farmers have cultivated it as a food crop for a thousand years. These days one agricultural variety (var. sativum) is grown for its roots, which are the source of the coffee flavoring. Another variety (var. foliosum) produces salad plants such as radicchio, Belgian endive, and French endive. A different but related plant (Cichorium endivia) is cultivated as “endive” or “curly endive”. According to one account, an early governor of Massachusetts, James Bowdoin, introduced chicory to this country in 1785 because he liked it in salad. By another account, Thomas Jefferson grew chicory as a hay crop at his plantation in Monticello, Va. by 1795. American farmers have cultivated chicory as a food crop for about 100 years. Chicory is non-native, but it has fit in among our native plants, becoming naturalized, rather than invasive (except perhaps in Colorado). It prefers soils with some limestone, so our acid soils in eastern Massachusetts aren’t the most favorable for it. But, like many weedy wildflowers, chicory is a survivor. Besides roadsides, you can find it growing around the edges of parking lots and fields, in pastures and near barns, in rocky soils and vacant lots, and even in the cracks of sidewalks and asphalt. What helps chicory survive in these places? Its thick, long taproot is at least part of the answer. The taproot can be 6 inches long or more, growing deep for water that other plants can’t reach. The root also stores carbohydrates and helps the plant survive as a perennial from one growing season to the next. The taproot helps to make the plant attractive to humans, who have transported it from place to place and continent to continent. When roasted and ground, the root can be added to ground coffee to flavor it or to stretch it when coffee prices skyrocket. It also serves as a caffeine-free substitute for coffee and has been used to flavor some dark beers. For anyone inclined to dig up a wild chicory root and prepare a chicory drink, the directions are simple but take time. First scrub the root and then roast it in a slow oven (200-250 degrees) until it’s brittle and snaps when you break it, about 4-6 hours. Cool it and grind it in a food processor. Use 1-1/2 teaspoons per cup of water to brew it like coffee, or use it to flavor soups and sauces. People also boil and eat the root as a vegetable. Native Americans in some parts of the country liked to chew the fresh root like chewing gum. Chicory root contains a carbohydrate known as inulin, which today’s food industry uses as a sweetener or added fiber in some foods. (Check for inulin among the ingredients listed on food labels). The leaves at the base of wild chicory look much like dandelion leaves – a clue that chicory and dandelions are related. Both dandelion and chicory leaves can be picked for salad greens when they’re young, but older leaves are bitter. Some people boil young leaves for 5-10 minutes and eat them. Livestock eat chicory, which is a hay crop in some countries. Local wildlife, such as deer, also nibble it. The plant contains a substance that’s toxic to roundworms, which are often parasites in the intestines of animals, so chicory in hay can help reduce these livestock parasites. Farmers also sometimes rotate chicory crops with sugar beet crops to reduce soil roundworms that attack beets. 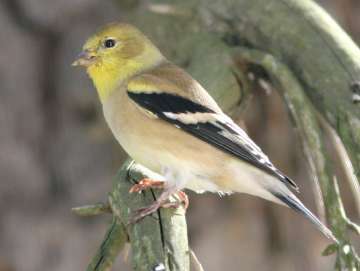 Goldfinches, such as this male in winter plumage, feed on the seeds of chicory in the fall. Chicory leaves were a source of blue dye in the past. What about those big blue flowers? They also provided dye – but surprisingly, a yellow dye. They too are edible, but without much taste. They can serve as edible decorations on food. The flowers are also another reason for chicory’s survival and success. 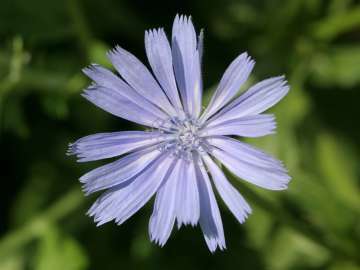 Like dandelions, daisies, and many other plants, chicory is in the aster (or daisy) family (Asteraceae), which is the largest and most successful plant family on earth. It’s also called the composite family (Compositae) because of the way the flowers are set up. What we see as a single daisy-like flower is actually a collection, or composite, of many flowers. In the case of chicory, each “petal” is a separate flower, with its own pollen-bearing and pollen-receiving parts. Why is this type of flower so successful? The compact grouping of flowers (petals) in the flowerhead makes pollination very efficient. The group is easy for bees to spot, and in a single visit, a bee can check out many flowers, not just one, and transfer pollen in the process. Chicory is pollinated mainly by bees, including honeybees (Apis mellifera) which also originally came from Europe, and various native bees. Chicory flowers eventually produce seeds, which are popular with goldfinches (Carduelis tristis). These birds nest late in the summer, when thistle seeds are ripe, but they also go for chicory seeds, and spread them in their droppings. Chicory reproduces only from seed (not from roots or underground runners). Chicory leaves and roots have had medicinal uses in the past, often to treat digestive or skin ailments. It’s not surprising that legends have sprung up about a plant with large flowers and a long history of human use. Chicory has two legends involving maidens being turned into flowers. One is related to another name for the plant, blue sailor. In this tale, a maiden fell in love with a sailor, who went off to sea and never returned. She spent her days waiting for him by the roadside, until the gods took pity on her and turned her into a blue flower. In another, more sinister story, a lovely maiden refused the advances of the sun god. In response, he turned her into a roadside flower so every day she would have to look at him until she wilted from his brilliance. If you’re interested in other useful and edible wild plants in our area, mark your calendar for “Fall Foraging” on Saturday, Oct. 24, 1-3 pm, with Arthur Haines of the New England Wildflower Society. Meet at St. Luke’s community gardens, near the northeast corner of St. Luke’s cemetery.